My Uncle Jimmy died this week. After a battle with cancer he passed at the age of 83 surrounded by his family. Uncle Jimmy (aka James W. Ferrante) was my great-grandmother's oldest son and my grandmother's brother. Uncle Jimmy was something of a celebrity in our family. He lived in Guam and would visit the East Coast once or twice every ten years or so. Every time he showed up it was an event. The whole family would converge to my great-grandmother's house to see Uncle Jimmy and hear about what exciting things was going on in his life. From what I can gather, Jimmy was a jack of all trades and master of none. Ask a any member of the family about what Uncle Jimmy did for a living and you'd hear a different answer. He was baker, an entrepreneur, a small-business owner, an importer-exporter, a boxing commissioner, and a butter sculptor. As a kid I didn't care what he did. All I knew was he wore fancy clothes, drove expensive cars, and gave us presents. 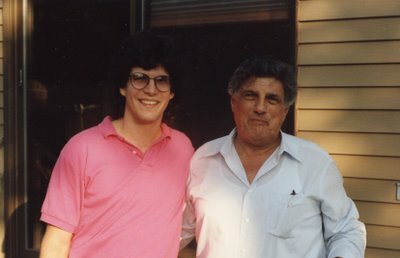 As an adult I learned that when he did come to visit he'd leave my grandmother with $300 phone bills and the presents he gave us were nothing more that gifts he received from liquor distributors. I also learned that some even questioned the validity of his stories. Frankly, I don't care. Whatever the truth may be, no one will ever deny the fact that when Uncle Jimmy showed up it brightened up our every day lives. He brought excitement and a sense of real accomplishment and pride to our Italian family. But even more so, when Jimmy came to town he brought the family together and we ate and laughed and ate some more. Rest in peace Uncle Jimmy and thank you for the Member's Only jacket. Remembering Jimmy Ferrante KUAM takes a look back at the accomplishments and life of the former Guam boxing commissioner. Guam has lost one of its most influential and well-respected members of the athletic community with Monday's passing of the 84-year-old chairman of the Guam Boxing Commission, Jimmy Ferrante. Be it resurrecting pugilism or fostering a culture of excellence for all athletic events, his mark will be felt for years after his death. A product of the ethnically diverse steel mill community in Youngstown, Ohio, Ferrante was headed for a childhood full of trouble. Fortunately, at the age of 9, a police officer known to the boy as Officer Traffican introduced him to the world of boxing. The young Ferrante formed a passion for the noble art, which he spread for 60-plus years on the island. "He liked boxing because it is a man's sport, because it's a way of survival. You know, guys like Rocky Marciano and Joe Lewis. The sport taught individuals to survive and overcome challenges," said friend and owner of Saralu's Boxing Team of Champions, Jose Saralu. Arriving on Guam in 1944 as part of a U.S. military construction battalion, he proudly served during World War II. Before fighting in Iwo Jima, the then-21-year-old Ferrante fell in love with future wife Kitty Tenorio (who he would go on to marry in 1946). Ferrante was a heavyweight champion while in the military. Going under the nickname "Blackie," his wife still referred to him by the name even in his twilight years. Guam became his new adopted home and he wasted no time bringing professional athletes to the island. Friends of Ferrante heard his countless stories of how he produced athletes such as Joe Lewis and Joe DiMaggio on Guam. "He was always bringing up those stories," said Saralu. He quickly fell in love with the island and successfully fought to bring boxing up to par with the rest of the United States. As boxing commissioner in his later years, Ferrante fought a final uphill battle to bring boxing back to the prominence it formerly possessed on the Guam. "He was hell bent on getting boxing back on Guam," said Kontenda's Gym owner Brant McCreadie. Events such as the First Amateur Boxing Classic 2004 were created by Ferrante to develop a ranking system for local fighters and eventually have them participate in the Olympics. He had a hand in jumpstarting boxing gyms in and around the island and was a leader in showing the MMA promoters how to put on an event and prepare the sport for future growth. "He had a lot of Guam pride and he didn't want to set our standards lower than anywhere else," said Roman Dela Cruz, a representative for Fury MMA. One such example was his adoption of the strict event standards of the Nevada Boxing Commission. "He really saw our potential to grow as a big-timer and made it so we're ready if we get into that field," added Dela Cruz. The final boxing event Ferrante had his hand in planning will take place August 18. "I'm sorry that Ferrante won't get to be at the event," said Saralu. Be it in the future, the renewed interest of boxing on Guam or the hand he had in shaping the MMA events that are so prevalent today, Ferrante's actions will continue to be felt and appreciated by the athletes and spectators of the island.